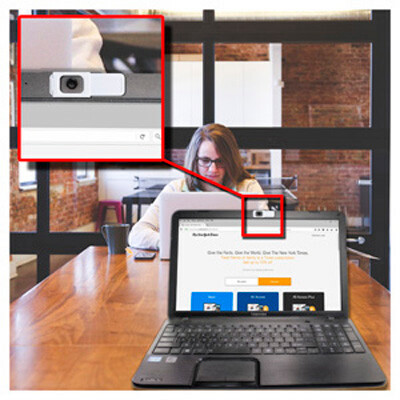 Features: WebCam Cover Slide provides the ultimate privacy protection against Webcam hackers while offering a high impression branding area. Simply peel off the rear liner to expose the 3M double-sided adhesive that works on all devices. Webcam Cover Slide suits computer`s, laptops, smart TV`s, monitors and some external webcams. Includes instruction backing card. Material: ABS. Certification: Patent USD669,1125, RoHS. Product Colour: Black, Silver, White. Product Size: 34.5 x 12 x 1.5 mm. Print Area: 12 x 9 mm. Print Process: 4CP Direct Digital. Delivery: 2-3 weeks (indent) from art approval. Standard Packaging: Backing Card. Packing Details: 500 pcs per carton, 2.5 Kgs, 31x31x22 cms. Setups: Included.